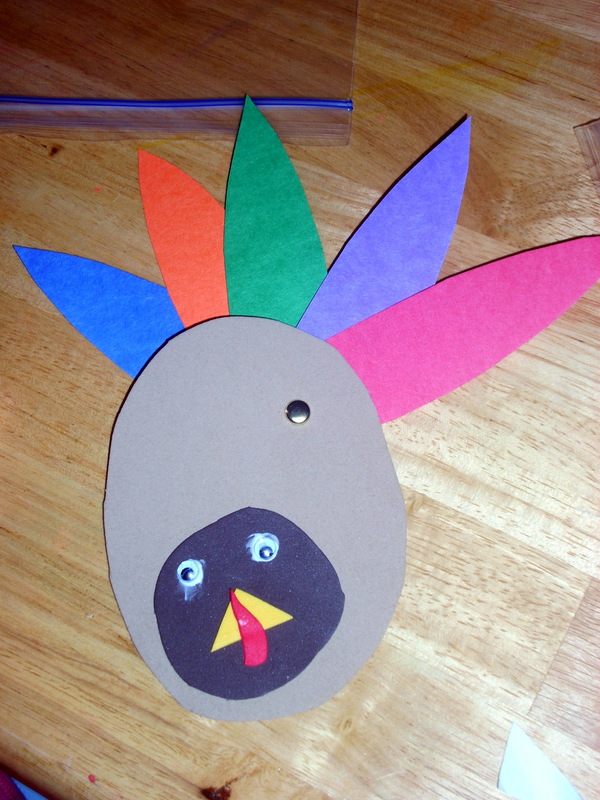 With Thanksgiving right around the bend, it might be a fun time for a little turkey craft at the kiddie table. That’s right, I used the word craft. Remember, there’s a Spectrum of Preschool Arts and Crafts. There are times when a craft may better fill your objectives, but as I mentioned in last year’s Turkey Time Craft, you have to be sure your craft matches the abilities of your children, that you have the time and extra adult assistance that crafts require, and that you are willing to let go of the final product and let the children own it. With this year’s activity, you need craft glue, googly eyes (I’m pretty sure that’s the technical term:), brass fasteners, about five colored feathers cut from construction paper, one oval cut from non-sticky brown craft foam (I cut two from one sheet), one circle cut from sticky-back craft foam in a different shade of brown, a yellow triangle out of sticky back foam, and a tear-drop shaped waddle from red sticky-back foam. Before starting the project, you might want to read a Thanksgiving story. I recently enjoyed reading The First Thanksgiving Day by Rhonda Gowler Greene (followed by this snack activity) and then The Night Before Thanksgiving by Natasha Wing. After the second book, we had a great discussion about similarities and differences between the two stories. Then we got ready to make our turkeys! We began the turkey craft with a review of shapes. Then, as I walked through how to build a turkey, I was able to refer to the oval, the circle, the triangle, and even the tear-drop shape. It’s a great way to emphasize that knowledge of shapes so that the children incorporate that knowledge into the experience. So here’s the quick version of the instructions: Use the oval as the body, the circle as the head, the triangle as the beak, with the tear-drop as the waddle. Use the glue to attach the eyes. Next, attach the feathers with the brass fastener. I swear the first time I did it, I popped right through the foam and all five fasteners, but I’ve yet to repeat that performance! It seems easiest to go through just the foam first, then the feathers (two or three at a time). Then fan out the feathers for a complete turkey! In addition to incorporating shapes, you can also talk about the colors used in the feathers, as well as counting how many there are. You could even count by fives, counting all the feathers in your group if your children are at that level. If you want to add a whole language element, ask the children what they’re thankful for, and write what they say on each of the feathers. And since this is the season for gratitude, I really need to express my gratitude to you, the readers of Not Just Cute. Thanks for reading, sharing your ideas, offering your support, and challenging me with questions. Thanks for tweeting, liking, linking, and sharing with your friends. My life is blessed by you.